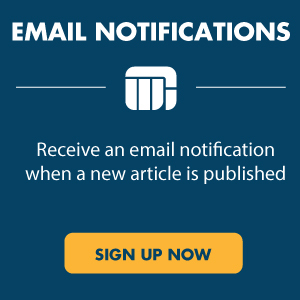 Washington Trust Bank Blog | Is Former Fed Chair Bernanke Manipulating Data to Prove His Case? Is Former Fed Chair Bernanke Manipulating Data to Prove His Case? “Arguably, the Fed’s actions have not led to permanent increases in stock prices, but instead have returned them to trend.” His time frame for his trend analysis starts at the fourth quarter of 2001 through the peak of 2007. As I have written in a previous blog (click here to read), Bernanke stated many times that one of the goals of QE was to raise stock prices. I would argue that manipulating stock prices is outside of the Fed’s dual mandate, but I’m sure Bernanke would counter that it was within the maximum employment mandate. Regardless, stock prices rose during all QE programs and the former Fed Chair is now implying that the Fed’s actions simply brought the market back to norm. However, he is carefully selecting his data to prove his point. Let’s first consider the trend he delineates: the fourth quarter of 2001 through the fourth quarter of 2007. I have drawn a white line on the chart of S&P 500 Index below highlighting this trend. As you can see, he is correct. This trend has been continued; however, the choice of the timeframe is curious, to say the least: from the bottom of the tech bubble burst to the top of the financial crisis – basically the bottom of one bubble to the top of the next, both bubbles aided by Fed policies. 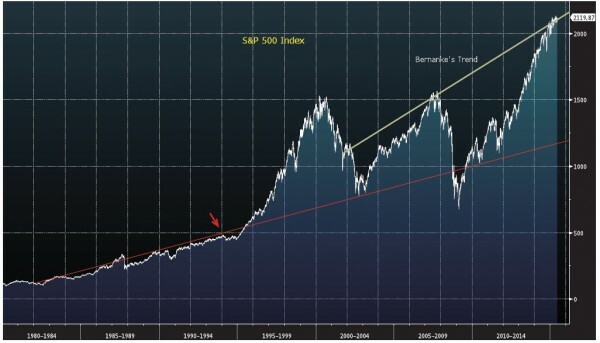 If instead we drew a trend line from the early 1980s, when the long bull market began, the slope would be much lower and our current market would be well above trend. Which trend you wish to support determines the starting point, and only time will tell if either is accurate. Now, let’s consider the statement that most would conclude that current stock prices are at “normal” levels. I also discussed the current level of stock prices in a previous blog (click here to read), and as I stated then, there are arguments for and against the current level, but to make the statement that most would lead to a similar conclusion is misleading and far from accurate. I agree with Bernanke and believe the Fed needed to step in to prevent further problems after the financial crisis ensued, but I would argue that many of the Fed policies of the previous 10+ years contributed to that crisis. Needless to say, if you are a stock investor, you got bailed out and you have been well rewarded since the collapse. Unfortunately, if you are a bond investor, you have not fared as well and have seen your income dwindle to practically nil. Bernanke carefully selects his data to prove that the Fed’s intervention was benign. At present, we cannot draw that conclusion. Only time will tell if the Fed’s experiment of massive intervention was benign or if it had negative long-term consequences. Washington Trust Bank believes that the information used in this study was obtained from reliable sources, but we do not guarantee itsaccuracy. Neither the information nor any opinion expressed constitutes a solicitation for business or a recommendation of the purchase or sale of securities or commodities.